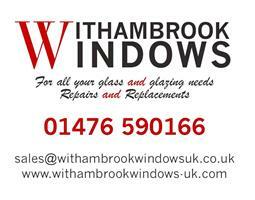 Withambrook Windows Installations Limited - Fascia/Soffits/Guttering, Garage Doors, Windows/Doors/Conservatories based in Normanton, Nottinghamshire. We all know that the double-glazing industry can be considered unscrupulous, and here at Withambrook we work hard to maintain ethical standards of the highest level. Customer testimonials and references confirm we are a company that cares about customer satisfaction. We take a good old-fashioned pride in our installations and this, combined with a contemporary response to customer needs means that Withambrook customers stay Withambrook customers. We conduct our own service work to ensure the obligations of our guarantee are maintained. We do not use sub-contract fitting teams. Our teams have employed status and have been company-trained to ensure our exacting standards are met. As a market leader, our company adds new products to our ranges on a regular basis ensuring that clients have access to top-quality brands, and to the most advanced products in terms of energy efficiency, security and durability. Whether you’re looking for double or triple-glazing, doors of numerous styles and specifications, conservatories or garden rooms, fascia and soffits or attractively coloured electric roller garage doors, Withambrook is quite simply the clear choice. A FENSA registered company, we also provide insurance-backed guarantees on all products for peace of mind.